This peach raspberry jam is my husband's new favorite jam of the season. 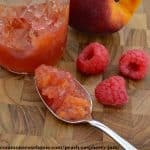 Peach jam and raspberry jam are great by themselves, but peach raspberry jam leads to a new level of “yummy” for your homemade jam. This recipe was adapted from a recipe shared by one of our readers in response to my request for your favorite peach recipes. I cut the sugar and switched to a low sugar pectin to bring out the fruit flavor. My favorite low/no sugar pectin is Pomona's Universal Pectin, which is GMO free and leaves no “off” flavors in your jam or jelly. Each box of Pomona's Pectin contains calcium powder and pectin, along with instructions for mixing the calcium water. (It's just 1/4 teaspoon powder in 1/2 cup water – easy peasy.) One box makes several batches of jam or jelly. If you don't have Pomona's Pectin, use another low sugar pectin and adjust the recipe accordingly. Click here to buy Pomona's Pectin online. 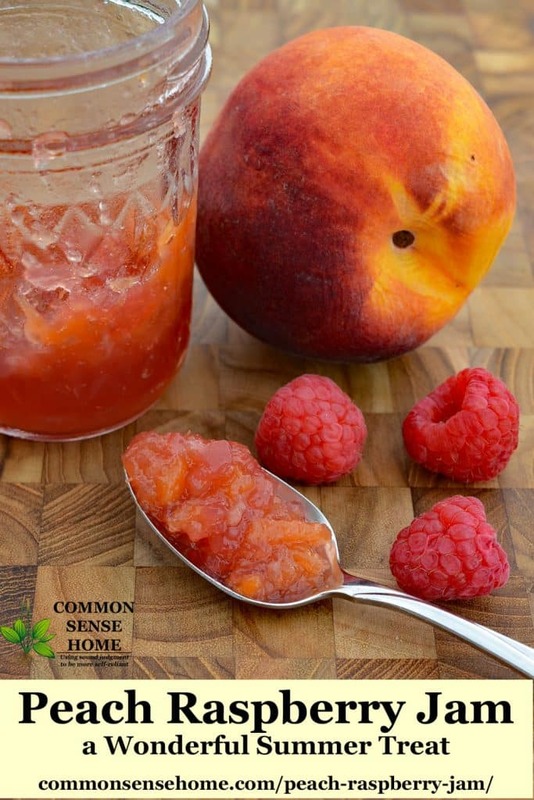 A yummy blend of peaches and raspberries in a low sugar jam. In a large, non-reactive pot, combine peaches, raspberries, lemon juice, and the calcium water. Bring to a full boil. 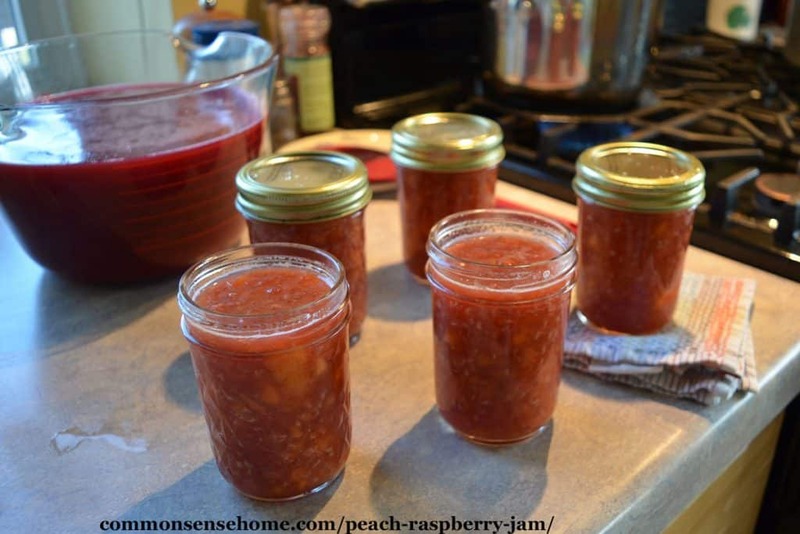 Ladle the peach raspberry jam into sterilized jars leaving 1/4″ headspace. Wipe rims clean and screw on the lids. Process for 10 minutes in water bath canner (add 1 minute for every 1,000 feet above sea level). Jam will last about three weeks once opened. Makes around 5 cups. If you love peach raspberry jam, make sure to check out our other blended peach jam recipes on the site – Peach Vanilla and Fuzzy Navel. Both are low in sugar and thickened with Pomona's Pectin. I love your blog just the way it is. Really like the recipes and hearing about your life. Thanks for being you.